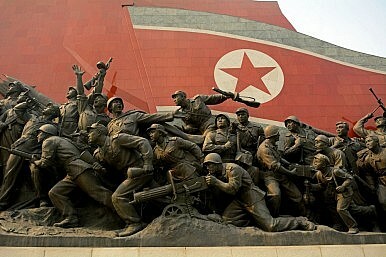 Look to Libya in 2011 to see what Pyongyang’s elites have long understood. It was Libya in 2011 – the uprising against Colonel Muammar Gaddafi and the subsequent shocking scenes of a bloodied dictator reduced to waiting on his fate in a dusty street just west of Sirte – that reinforced North Korea’s long-held belief that the only way to truly deter an outside attack would be to maintain and develop its own nuclear weapons program. Whether one is to agree with the international intervention in Libya or not, it is true that Gaddafi, the only ever international leader to give up his nuclear weapons program, was betrayed. He had renounced his weapons program, cooperated on Lockerbie, and handed over to the West its files on al-Qaeda and the IRA. Political, economic and cultural relations had developed but when the rebel-led uprising arose, a Western military coalition provided the support to remove him. This, together with the invasion of Iraq over a decade previously, forged a deep and very genuine suspicion of the West among the North Korean elite. The DPRK has survived for so long, against all odds, far outliving other repressive states, largely because of the astute Machiavellian brilliance of its political strategy. It knows that in order to increase the likelihood of self-survival, it needs a nuclear weapons program, being astutely aware that a nuclear-backed state is never going to be invaded by an outside power because the risks would be too great. For many years now, the sole raison d’être of North Korea has been the self-preservation of the ruling family and the surrounding elites, ahead of any attempt to genuinely improve its economy or reduce the shocking levels of daily poverty found across the country. Almost all actions taken at the domestic and diplomatic level have been aimed at achieving the overall objective of self-preservation. North Korea, therefore, will absorb the pain of sanctions, because from its perspective disbanding its weapons program is akin to suicide. While it may lose out on luxury goods and Kim Jong-un may struggle to gain access to his favorite Swiss emmental cheese, from its view this is a small price in avoiding the fate of Gaddafi. Sanctions of course also depend on Chinese willingness to enforce them for a sustained period of time. This is by no means guaranteed – China has been notoriously lax in previous bouts of sanctions aimed at making life difficult for the North Korean regime. Chinese and North Korean elites are well versed in moving money around through the black economy and testimony from local business leaders suggests that the sanctions are not likely to cause serious damage or fundamentally change business dealings. Ultimately, all of the international sanctions and rhetoric doesn’t change the fact that the world is far more reluctant to engage in conflict with a nuclear armed North Korea than it was with a non-nuclear armed Libya. The gruesome end to Gaddafi’s rule has likely confirmed what Kim Jong-il and now Kim Jong-un have long understood: A dictator who wants to hold on to power should also hold on to his nuclear weapons. While the sanctions may hurt North Korea economically, and even slow the rate of nuclear proliferation, they will not bring real change to North Korea. Jack Hands is a former political advisor, having worked in the U.K. and European parliaments. He has written for several major political blogs, notably Conservative Home. Currently based in Korea, he is a former founder of North Korea Campaign UK, which campaigned for awareness of the plight of political prisoners inside North Korea. Follow him on Twitter @jackhands1. To stop nuclear and rocket demonstrations, measures need to be more targeted.